Pro Bands provide the key in safely and effectively building upper/lower body strength and increase lateral speed and forward acceleration. At its core, all exercise involves resistance. The Pro Bands give you all the benefits of resistance—increased strength, flexibility and stamina—in a portable size. Use them to warm-up muscles and prime joints, for strength and flexibility training and to help increase lateral speed and forward acceleration. 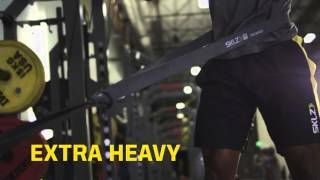 The universal bands that do it all and last longer, Pro Bands offer you a proven way to increase both upper and lower body strength. In addition to their resistance training, Pro Bands are perfect for priming joints and warming-up muscles before any activity. Add Pro Bands to your speed training. Use their resistance to increase lateral speed and acceleration. Integrate them into a dynamic warmup that prepares the body for speed work. They’re perfect for lower body power development, lateral shuffles, and linear speed work. Take your resistance both ways. Use Pro Bands to add resistance to common exercises like push-ups and squats or their recoil to assist in pull-ups and dips.